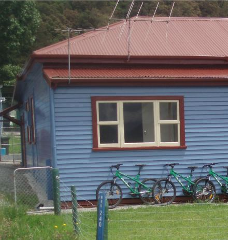 Our accommodation is in the form of a three bedroom selfcontained cottage, located in the village of Woodstock, five kilometres east of Hokitika and 2 kilometres from the Kaniere Bridge. Quite easy to find, it is situated next to the Royal Mail Hotel, known locally as the Woody. Very handy for a post ride pint and snack. Our cottage accommodation has two double bedrooms & a four berth bunk bedroom which are all newly renovated & comfortably furnished.The kitchen & bathroom are communal We rent out by the room or we can rent out the whole cottage for families or groups. There is plenty of room for parking, and for those with their own bikes, a safe & dry lock up. There is also a workshop with bike stand & tools for those mid adventure repairs & adjustments. This is located across the road at our residence, and I'm more than happy to assist with repairs and adjustments. 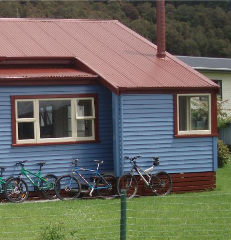 For guests travelling without a vehicle, we will of course provide transport between Hokitika & Woodstock and to the local bike trails. We tend to be booked well in advance so Enquire today. 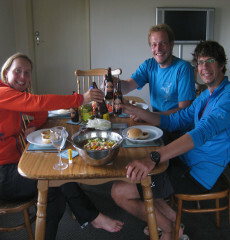 The lounge & dining area looks out over the Hokitika River. It has TV with video & DVD player.Cosy fire for the winter so you'll always be snug & warm. 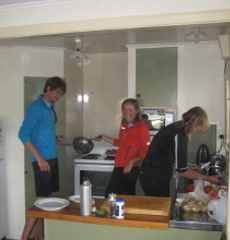 Our self catering kitchen has everything you need for that post ride nosh up. For those who don't cook, the Pub next door has good country tucker. 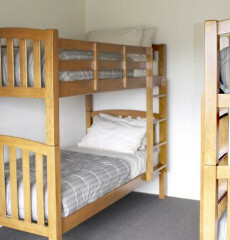 This is our bunk room. There are four bunks, & they are extremely comfy & the morning sun will ensure your'e not wasting ride time. 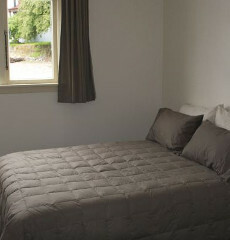 ...of which there are 2, each have a double bed. The double beds are comfy, & there is plenty of room for you to hang your clothes and gear. With a communal kitchen and living area, you get time to relax and reminisce on (or embellish) your daily adventures with others that share your passion. Walking distance from food and a couple of quiets, this is the perfect place to finish the day.